The A401 has a 2-pin connector. This is our standard sensor with the largest sensing area:?25.4 mm (1 in.). A401 sensors are available in one force range:?111 N (0 – 25 lb). * The force ranges stated are approximations. The dynamic range of this large force sensor can be modified by changing the drive voltage and adjusting the resistance of the feedback resistor. 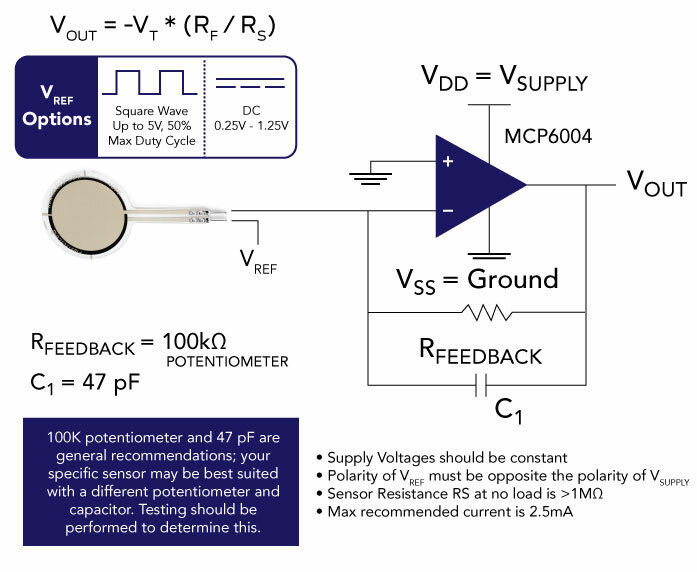 * Measurement ranges of 0-1 lb and 0-7000 lb are achievable with the A401 sensor by utilizing the recommended circuitry. The force range can be extended by reducing the drive voltage, VT, or the resistance value of the feedback resistor, RF. Conversely, the sensitivity can be increased for measurement of lower forces by increasing VT or RF. ?For an alternative to the recommended circuit, see the?Related Electronics?tab.